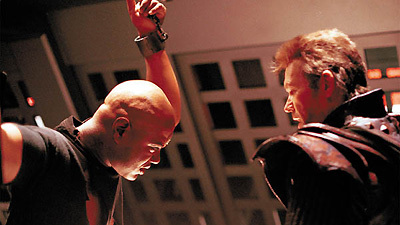 While visiting Chulak to raise support for the Jaffa rebellion, Teal'c is betrayed by Rak'nor, a fellow Jaffa, and is captured by the Goa'uld. He is imprisoned on a ship belonging to Heru'ur, but despite repeated torture, he remains defiant, refusing to retract his condemnation of false gods. Meanwhile, unaware of his fate, the rest of SG-1 joins Jacob Carter in an attempt to thwart an alliance between Apophis and Heru'ur. As the two most powerful System Lords, an alliance between them could topple the balance of power among the Goa'uld. The meeting is to be held in neutral territory, an ancient floating minefield orbiting the Tobin System, and SG-1 plans to sabotage the negotiations. Carter and Daniel attempt the delicate procedure of capturing and reprogramming one of the mines to recognize the energy signal of Apophis's ship. When released from the cloaked cargo vessel, the mine will target Apophis, who, believing Heru'ur to be responsible for the treachery, will return fire. All is in place when Heru'ur reveals that he has brought along an offering to Apophis to seal their agreement, a beaten but determined Teal'c. SG-1 is faced with the horrifying choice of completing their mission, or saving their friend. An attempt to rescue Teal'c by intercepting the matter stream between ships fails, but Teal'c has found another unlikely ally. Witnessing Teal'c's strength, Rak'nor has a change of heart, and helps Teal'c to escape in a death glider, just as the programmed mine targets Apophis's ship. However, Apophis reveals a surprise of his own, an entire cloaked fleet, which materializes and overpowers Heru'ur's forces, making Apophis an even more formidable threat. Apophis commands the army of Sokar. Heru'ur is alligned with the System Lords against Apophis. Apophis and Heru'ur control the two largest armies of the Goa'uld. An alliance between them could topple all other System Lords. A war between them could decimate both sides and return the balance of power to the System Lords. Apophis and Heru'ur agreed to meet within the mine field of the Tobin System to discuss a possible alliance. Their transmission was intercepted by the Tok'ra through Tanith. The Tobin civilization, originating from Earth thousands of years ago, has been extinct for several centuries. They left behind a large orbiting minefield in space, designed to protect the planet. The mines can be programmed to hone in on a variety of energy signatures. The symbols on the mines are similar to Phoenician letters, and translate as "Three to the blue, four to the orange, three to the blue." Allowing for the use of a zero, this becomes "Two to the blue, three to the orange, two to the blue." Rak'nor is the son of Delnor who was spared by Teal'c when he was First Prime. Delnor followed Bra'tac's rebellion, but when his whole family was killed by Apophis, Rak'nor remained loyal to Apophis. Teal'c is told that Bra'tac died under torture. Rak'nor used the Tok'ra password: Goach, sha kree, lo Goa'uld. With the death of Heru'ur, Apophis has now absorbed the forces of both Sokar and Heru'ur, and commands the largest of the Goa'uld armies.